In 2000 a 14-year-old was forced to drop out of secondary school when his family could not afford the fee. Nobody took much notice. Education is a luxury in Malawi. So is electricity. After he dropped out of school, William Kamkwamba got to work to secure this luxury for his village. Eight years later Associated Press journalist Bryan Mealer travelled to Malawi to tell Kamkwamba’s story. He spent months with Kamkwamba’s family, interviewing friends and relatives. 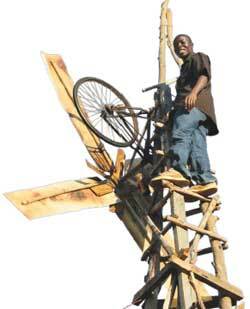 Mealer learnt about physics, magnets and electricity so he could understand what Kamkwamba had created. Kamkwamba’s inquisitive nature is apparent from the start. As a boy he takes apart radios to discover how they work and builds gocarts out of beer cartons. As he fiddles and tinkers with everything he can, tragedy strikes. A fam ine ravages Mala wi, and one sees the results from Kamkwamba’s perspective. Friends starve and people try to sell their children for food. Kamkwam ba’s family eats one frugal meal a day. Kamkwamba recounts witnessing mobs trampling children in their frantic push toward food. 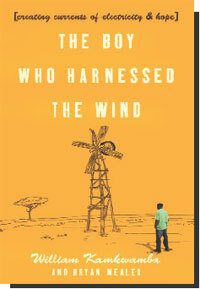 When the famine subsides, Kamkwamba, armed with American physics textbooks, starts building a windmill to pump water to the crops, he hopes to free his family from the whims of weather.